A youthful crowd at Norwood Live eagerly awaits an evening of well-schooled entertainment. This is the Revolution Vocal Studio (RVS) Artist Development Launch, a three-hour concert of music made by studio clients, working in conjunction with The Barefoot Musician to “guide singers and musicians into the music industry as working artists”. MC Sarah Whiteley introduces two of the event’s driving forces, Tania Savelli and Kelly Breuer, onto the stage. They deliver Jessie J’s Who You Are with aplomb; it’s a lovely vocal performance. The Brouhaha (aka Breuer) then plays three original songs. First it’s the understated power of As Long As There’s A Smile, which has the audience gently swaying. The soulful, jazzy Oh Mama follows and the impressive short set closes with Don’t Have To Write It Down. Next up is 15-year-old Saffron Williams, who presents three songs, including a stirring a Capella version of Tracy Chapman’s Behind The Wall. She is followed by the diminutive Gabriella Pansini, and there’s a hint of soft disco in the well-executed Wildest Dreams. Deborah Brennan previews her upcoming Joni Mitchell tribute show, assuredly and passionately presenting three of the Canadian songsmith’s works. Throughout the evening, solo acts are supported by other performers on various instruments and backing vocals, sometimes formalised as “The Revolution Corporate Band”. 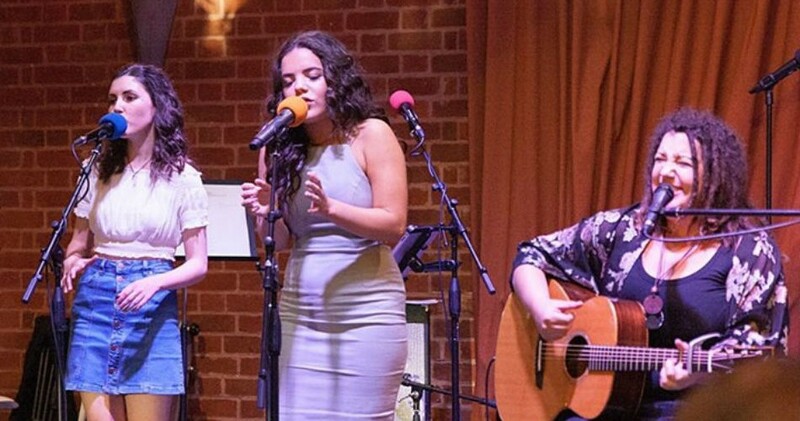 The interesting and memorable vocal style of Kayla Symons finishes off the first part of the show; she does a great job covering artists such as Sam Smith, Beyoncé and Amy Winehouse. After the interval, the vibrant duo Catch Eleven launch their single Señorita, and perform three other songs, showing the range of their pop/hip-hop sensibilities. The vocals are laid down over backing tracks, and the trumpet duet that finishes their set meets with approval. Alex De Porteous exudes a confidence and maturity that belies her young age as she showcases her cabaret act aspirations. A novel (and sanitised) version of Radiohead’s Creep goes down well. As a finale, the stage fills with musicians and singers and the night draws to an end with some great collaborations on Georgia On My Mind, Come Together and Stevie Wonder’s Isn’t She Lovely. It’s a fitting end to proceedings, highlighting the talent and the level of support for this group of musicians as they look to the future, and what it might bring.